without understanding the need to also produce millions of people on the streets of Britain. 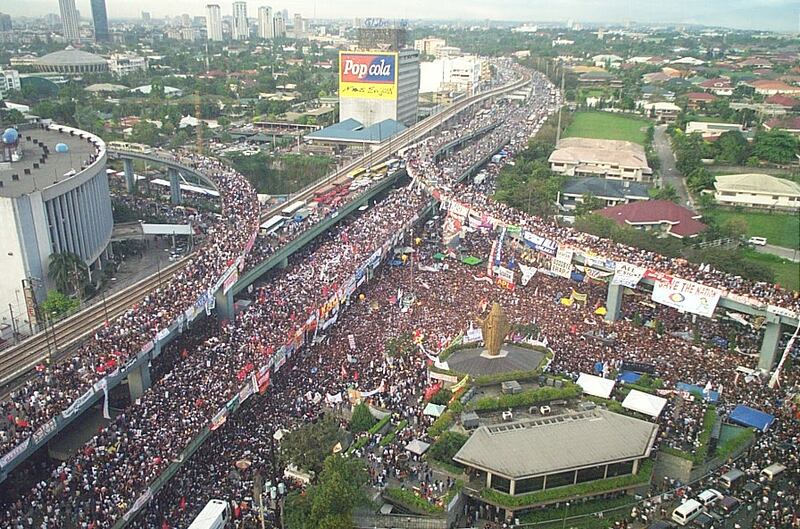 The EDSA Revolution of 2001 or the Second People Power Revolution, is the common name of the 4-day popular revolution that peacefully overthrew Philippine President Joseph Estrada in January 2001. He was succeeded by his then vice president Gloria Macapagal-Arroyo. EDSA is an acronym derived from Epifanio de los Santos Avenue, the major highway that encircles Metro Manila. The revolt took place in the business district of Ortigas Centre. The only means of legitimising the event was the last-minute Supreme Court ruling that "the welfare of the people is the supreme law." But by then, the Armed Forces of the Philippines days ago already withdrew support for the president, which some analysts call unconstitutional and most foreign political analysts would agree. William Overholt, a Hong Kong-based political economist said that "It is either being called mob rule or mob rule as a cover for a well-planned coup, but either way, it's not democracy." It should also be noted that opinion was divided during EDSA II about whether Gloria Macapagal Arroyo as the incumbent Vice-president should be president if Joseph Estrada was ousted; many groups who participated in EDSA II expressly stated that they did not want Arroyo for president either and some would later participate in EDSA III. It must however be noted that the prevailing Constitution of the Philippines calls for the Vice-President of the Philippines, who at the time was Gloria Macapagal Arroyo, to take the position of the President of the country during events that the current president cannot function in that capacity. During these demonstrations, Joseph Ejercito Estrada clearly was incapacitated, the government stifled, and that was even before the Armed Forces withdrew its support for him as president. World reaction to the administration change was mixed. Though foreign nations, including the United States, immediately expressed recognition of the legitimacy of Arroyo's presidency, foreign commentators described the revolt as "a defeat for due process of law", "mob rule" and a "de facto coup".